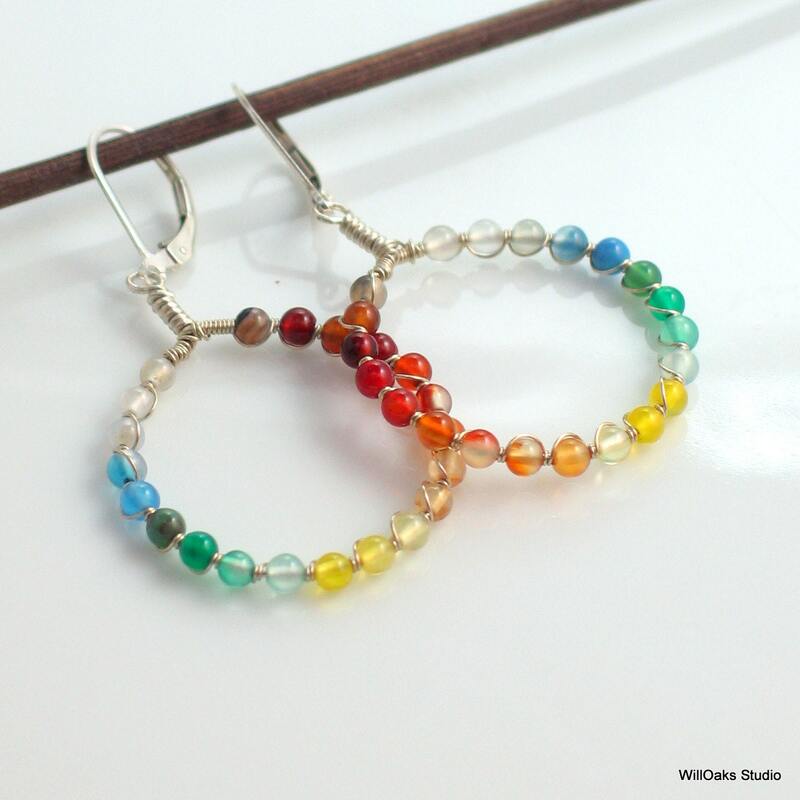 A rainbow of agates, in many different shades and colors, embellish handmade sterling silver hoops to dangle from latching sterling ear wires. 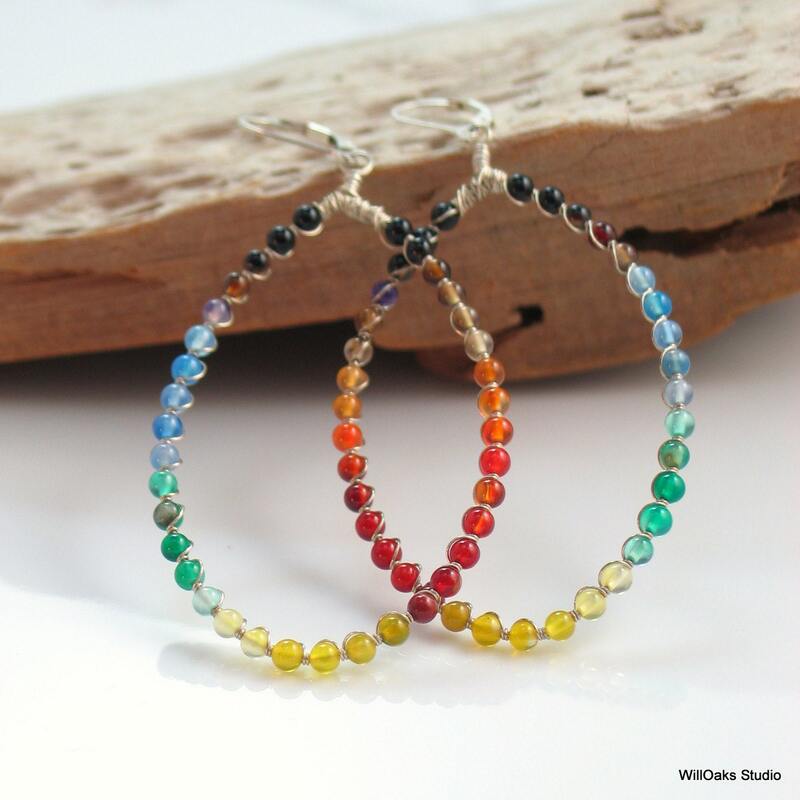 Cheerful, colorful stone beaded hoop earrings for any season made in a very limited edition with some natural variation. This might be the deluxe gift you are looking for! 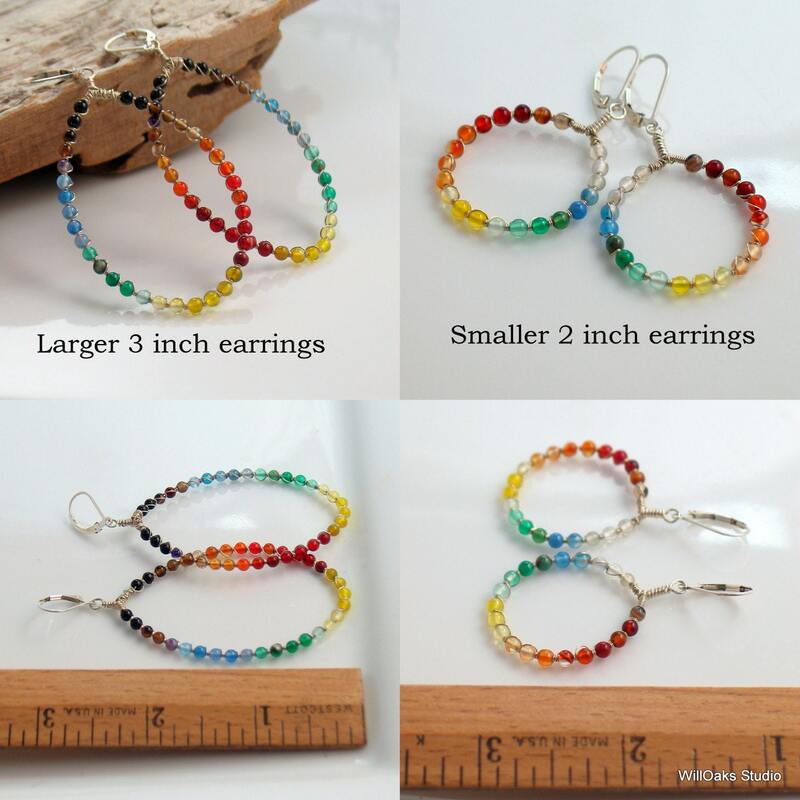 The smaller hoops are just under 1 1/4" (30 mm) in diameter and the total earring length is about 2" (50 mm) measured from the top of the self-latch earwire. The larger hoops are ovals 2 1/4" (58 mm) high by 1 1/2" (40 mm) wide and the total earring length is about 3 1/8" (80 mm) measured from the top of the self-latch earwire. 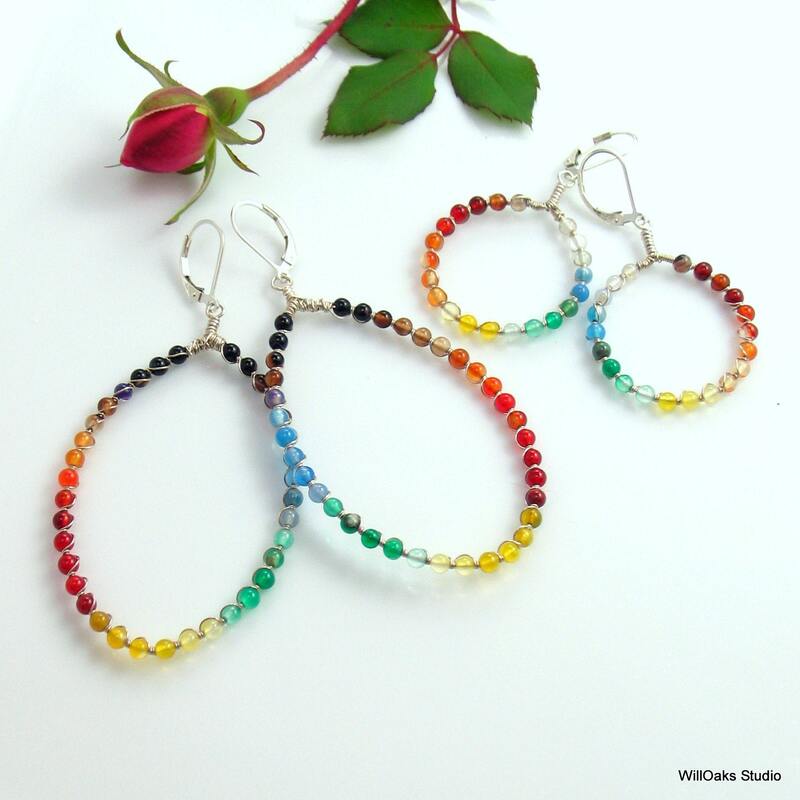 The agate rainbows are arranged from a collection of 3 mm agates. Natural, dyed or heated, this stone can be treated many ways to change the colors AND also comes naturally in a wide range of colors. Stone beads are threaded on to heavy gauge sterling wire, and captured with wire wrapping of finer sterling wire, and then hand formed into hoops with a loop for hanging built into the top. They swing freely from sterling self-latch earwigs. Shown in bright sterling, I can also darken and antique the finish of the silver if you'd prefer. Please select as you check out! WillOaks Studio earrings are presented on a custom card, wrapped and protected in my signature box, all ready to give or to keep. 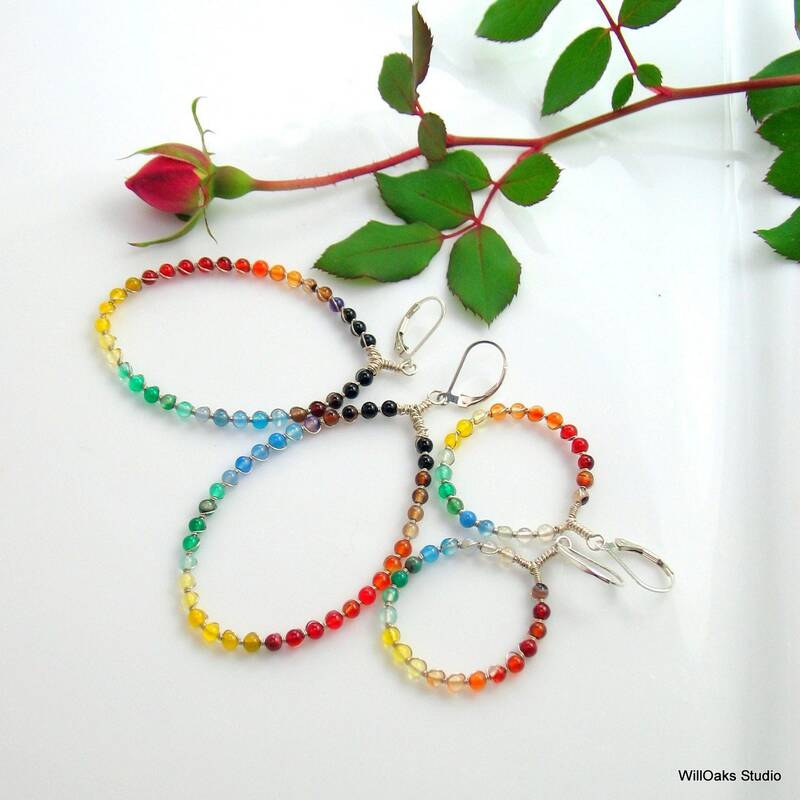 Rainbows hold so many magical, wonderful and beautiful meanings....these are a perfect gift for your rainbow lover.